Two pump clips were turned around today and just an IPA was available. It was pretty tasteless, I suspect it was Greene King IPA. Other than that it was all fizz and cheap food. Some dodgy people in and around the pub. I would be inclined to agree with Mattbeer regarding the service in the pub. Despite being the only people waiting at the bar, it was a while before any of the staff came over to serve us. Glasses were also piling up on the tables. So I'm not quite sure what they were doing. The pub was quite busy, which was surprising considering it doesn't really have very much going for it and considering there are so many better pubs nearby. Bombardier & Landlord were the ales on offer. Drinks are cheap but the place has no character. Gents toilets are horrible. I've been in here a few times to meet people before going to a proper pub and it always takes ages to get served - one of those places like Wetherspoons where 1 member of staff is serving at the bar and also taking food to the tables, while 2 other members of staff are just stood around wrapping cutlery in knapkins or refilling the tomato ketchup bottles! 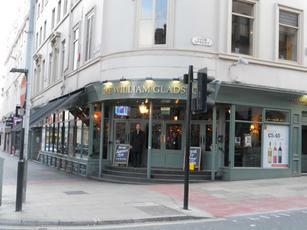 Now called The William Gladstone. Looks exactly the same inside though. A lively bog standard city centre bar. Don't expect anything special in the way of beer. I tend to use this as a meeting place before moving on. A word of warning, a friend of mine had his coat stolen from here after he left it on the back of a chair. This in no way reflects on the bar but more on the type of person you get trawling large city pubs.